Also there's a Disney earning call tomorrow, so perhaps something comes out of that. 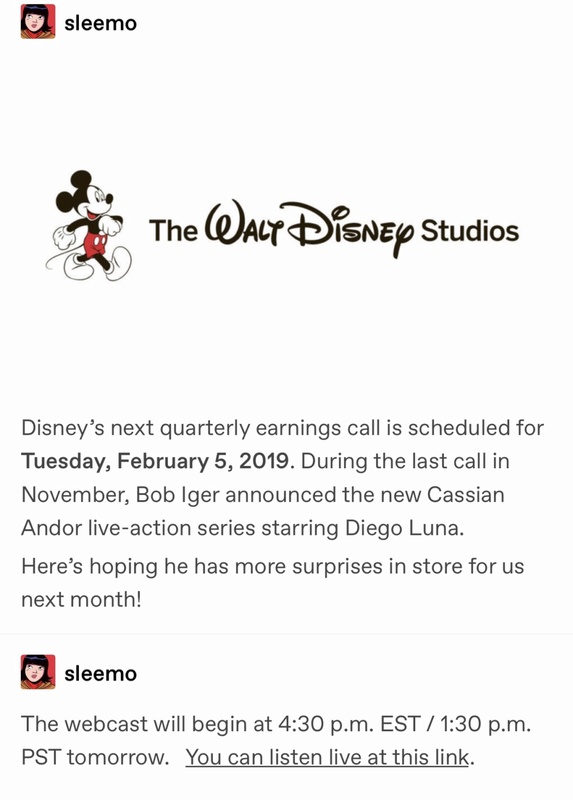 We heard about the Cassian Andor show this way right? 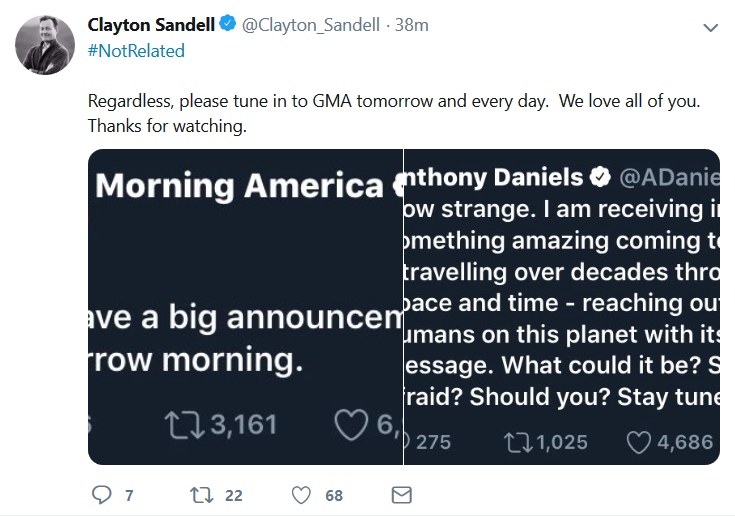 Oh Good Morning America ... that's getting serious. They won't announce a show on that. GMA means something major $$$ to promote, which has to be the streaming channel content, theme parks, or IX. @snufkin wrote: GMA means something major $$$ to promote, which has to be the streaming channel content, theme parks, or IX. Ahh! I want to get excited about IX news but don't want to get my hopes up. Maybe we will finally get the title? Fingers crossed! @tukicarreno I don't even know when the whole business of hyping up the titles got started because it wasn't that case when I was a kid during the OT. When the ST was announced, there was speculation around when the title would be confirmed and it shows over time how it's turned into an event itself, for better or worse. As noted in J.W. Rinzler’s wonderful “The Making of The Empire Strikes Back,” the working title of “Empire” was just “Chapter II” for quite some time. The first documented use of the title “The Empire Strikes Back” came from the transcripts of a story conference that took place from November 28, 1977 to December 2, 1977. Here’s where things get tricky and what’s probably the source of all of the title hoopla. The original title for “Return of the Jedi” was ... “Return of the Jedi.” According to J.W. Rinzler’s “The Making of Return of the Jedi” (in stores on Oct. 1), it was “Jedi” producer Howard Kazanjian who told George Lucas, “I think it’s a weak title.” A couple days after that conversation, Lucas renamed the film “Revenge of the Jedi” and officially announced that title at a press conference on May 14, 1980. For over two years, the title remained “Revenge of the Jedi.” In November of 1982, Lucasfilm hired a research center to test the word “Return” versus the word “Revenge.” On December 17, 1982, the title was officially changed back to “Return of the Jedi,” costing Lucasfilm quite a bit of money in already printed promotional items while, at the same time, creating collectables for fans. And honestly, some of this behavior, I know it's marketing/PR (though talk to somebody like our own @Piper Maru who works in the industry & you learn how badly they've handled it for the ST), but all it does is punch up mentions of their product in the current news cycle. Also maybe it's just age, but this is the 3rd time they've done a trilogy and teased that "this is the end." Which a lot of us here remember going through with the OT, so I'm really not in a hurry to get a title or trailer because experience tells me it'll be all over far too soon. GMA was a false alarm, this is from an ABC person. Still seems like there's a couple of directions something could come from in the near future. It's not even the title itself people are getting frenzied about, it's just having something, anything, to latch onto, as there's been a dearth of SW film content for a long while. It's people fighting over scraps, in a weird way. Mr Daniels is officially on the hype train! 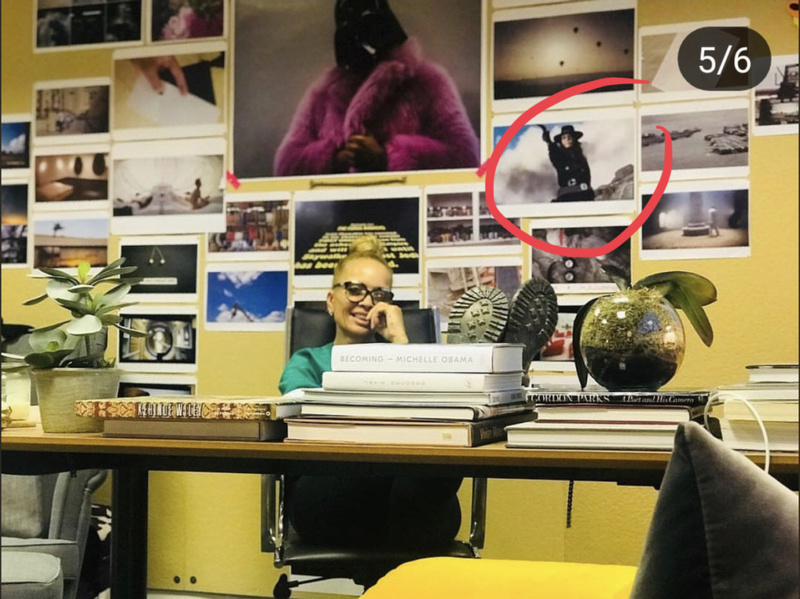 Rian retweeting Reylo stuff, lol. Gets 1000 likes in under 10 minutes. Well my excitement level is rising. Give me the title LF! I need someone to break that tweet down for me like I'm 5. Leone? @justyou wrote: I need someone to break that tweet down for me like I'm 5. Leone? A man with no memory of his past, a lost wife and child and a treasure? Hmmm... could be either about Rey and the truth about her parents fate and that she's the key to something she's unaware of, or it's about Ben pulling a Revan. When you say Ben pulling a revan do you mean that he’s got a past he doesn’t remember maybe with rey ? I often think we know so little about Ben solo and the interim period where he joined Luke . For all we know he might already have a child and wife or had a wife or partner in past ( maybe Keri Russell plays into this ? Who knows ).Just hope not really but it would play into whole Byronic hero as Rochester’s Ward Adele is possibly his daughter in Jane Eyre and both Cathy and heathcliff have children with other partners even though they are soulmates . Just hope not really as it would just make things more complicated. It might be totally off, but what if using the technique used on the Stormtroopers was also used on Ben and he forgot his real purpose? Maybe not with Rey, but maybe she has the ability to help him remember since she can see past/present/future things. Maybe because he lost himself, the saber chose her to replace him, not challenge him. "Lost Ben Solo we did. Lose Rey we must not"
This lack of news is killing me, seriously!!!! @lauvamp wrote: This lack of news is killing me, seriously!!!! Ugh!! I feel ya! They are totally doing it on purpose.. IT's working I guess, because all the fans are so eager and anxious for anything! I gave up hope that we would get a title when I read Pablo H's comment on twitter asking why people think we are getting a title today. I will laugh if it drops tomorrow. I know filming is pretty much done but I can't believe at this point they don't have a title less than a year from the premiere. I am coming to terms with them announcing the title in April during Celebration.